In general terms, with these types of steam showers and shower cabins, the thermostatic cartridges were rarely model specific. 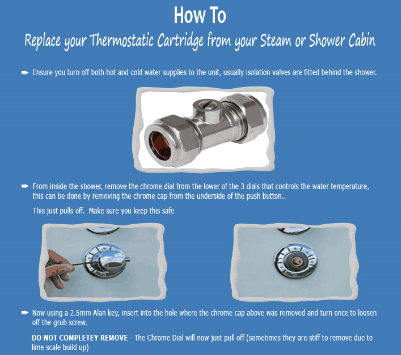 This means the only real way of making sure you buy the correct replacement, is to remove the existing thermostatic cartridge from your shower valve and compare this to the images shown for these, on the product page. 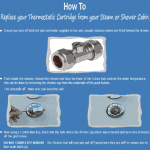 We have written a detailed guide here and also step by step instructions here on how to remove and replace a thermostatic cartridge. If you have dripping or water trickling out of whichever feature, (such as hand shower, hydro jets, overhead monsoon) is currently selected then your steam or shower cabin may need to have the on/off valve replaced. 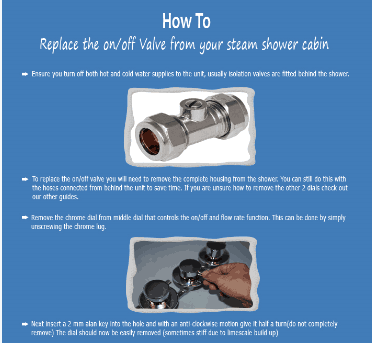 This is generally housed in the middle dial of the 3 dial shower valve, this guide will show you how to remove and replace it. Click here to view If you then want to purchase the on / off valve, click here .